"Coin-Grip Metallic" flooring is designed to be safe and long lasting with a visual appeal of its own. This PVC flooring roll comes in both silver and beige with a shiny finish, giving it a metallic look. Both colors provide a unique aesthetic to your facility. Its coin-textured surface gives this flooring some modern appeal, while still looking industrial. This coin top texture also provides traction in order to prevent slips and injuries. According to the National Safety Council, deaths and injuries in the work place cost $142.2 billion and 120 million work days in 2014. "Coin-Grip Metallic" flooring will make your facility a safer and more efficient place by preventing slips and falls. Not only safe, but also durable, "Coin-Grip Metallic" has longevity. Made out of PVC, it is chemically stable and is strong enough to protect existing surfaces from most physical abrasions. Its durability enables it to handle heavy oncoming foot traffic, making it popular for use in gyms, as industrial machinery padding, and for boat decks. PVC also has light oil resistance, making it popular for use among garages and industrial workplaces where common spillages occur. Not only capable of being used for multiple applications, this flooring is easy to install. Simply use double-sided tape for temporary installations. For more permanent flooring, using polyurethane-based adhesives over a wood or concrete floor will work. Rolls come up to 25 ft., but shorter lengths are sold by the linear foot, making for an easier installation process. This resilient flooring roll can be cut with the use of a utility knife for those who need even further modification. Installation is made even easier because this flooring is modular. Being lightweight and easy to roll up and it can be stored until needed. "Coin-Grip Metallic " makes flooring efficient and easy, saving you time and money. 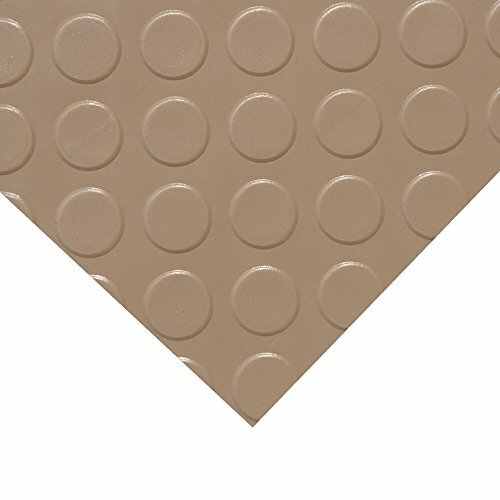 Tile Leveling System Wedges by RMS [Pack of 250]. WD-250 Anti Lippage Effortless Way to Lock In Your Large and Heavy Tiles. Get Professional Results Every Time.